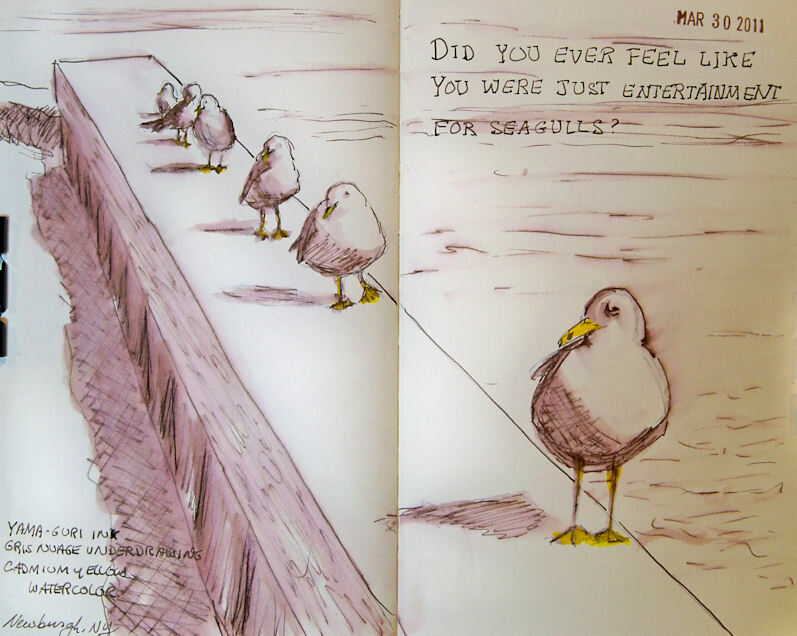 Did you ever feel like you were just entertainment for seagulls? 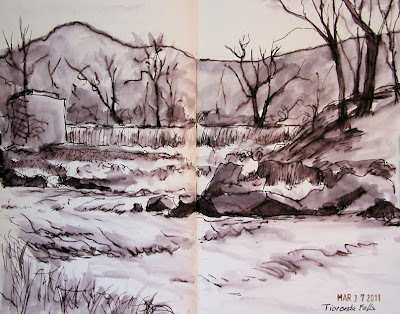 I was painting along the Hudson Riverfront in Newburgh, New York one day. These seagulls found me to be the most entertaining thing they'd seen for quite some time! They all lined up and watched me while I painted the river. I took a few photos of them before I left and sketched this tonight from one of the photos. 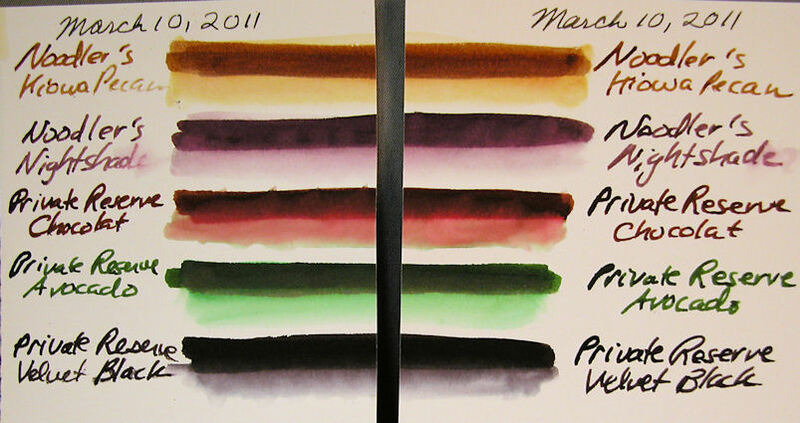 I want a gray ink to use with watercolors, so I've spent the past two or three days testing several candidates. Each of the little sketches above was done with one ink, so I could start to get an idea of how they would perform when used with watercolors. 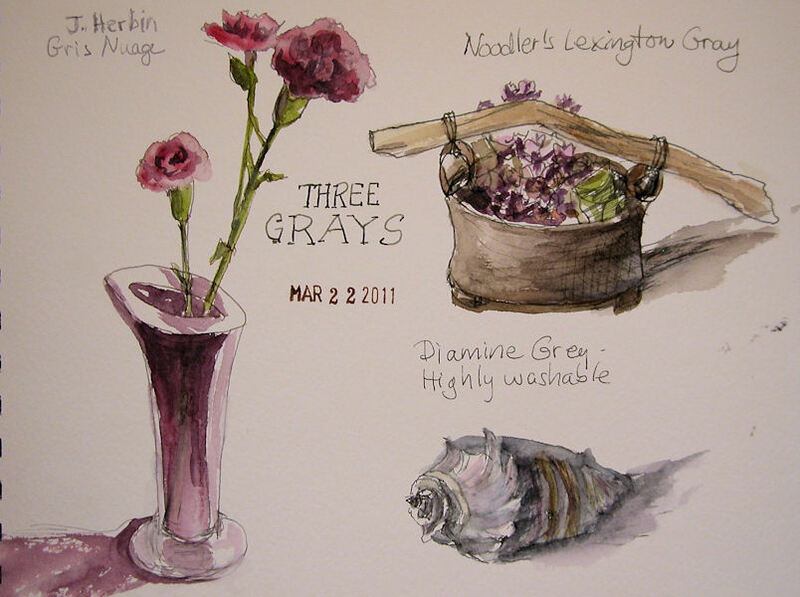 J. Herbin Gris Nuage is a very light, silvery ink. It looks purplish in the bottle. If you want something to use with watercolor that leaves a very light line like a hard pencil, or to fill a brush for light midtone areas, this is the perfect ink for that. Noodler's Lexington Gray is my personal favorite so far. It's completely bulletproof, considerably darker than the Gris Nuage, and is not as blue-violet in color. It's a nice mid-to-dark value, so it's easy to see on the page. The lines are not as obvious as with dark black ink, so it has less of an outlined, coloring book look to it, and it allows the color to sing, since it doesn't overpower with value. Diamine Grey is highly washable. It's a nice color and value, but it washes so easily that I can't keep my lines. It mixes with the color and everything gets dirty. This was a very valuable test for me. I think there's a bottle of Noodler's Lexington Gray in my future! 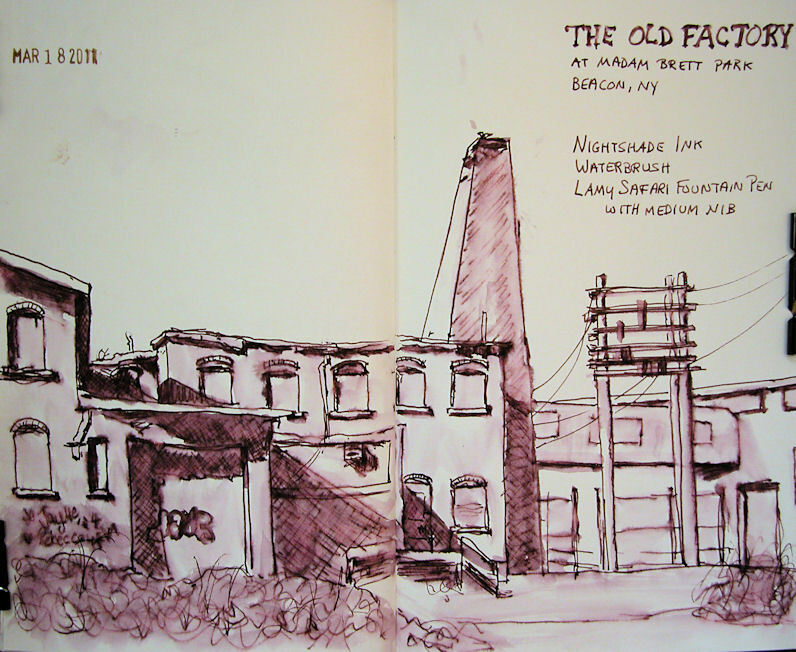 Yesterday I went back to Madam Brett Park in Beacon, NY and sketched the old, abandoned Tioronda Hat Works factory buildings. 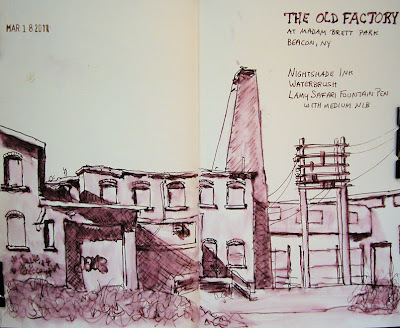 Built in the 1800s, this factory was powered by the creek and waterfall that I sketched and painted the day before. 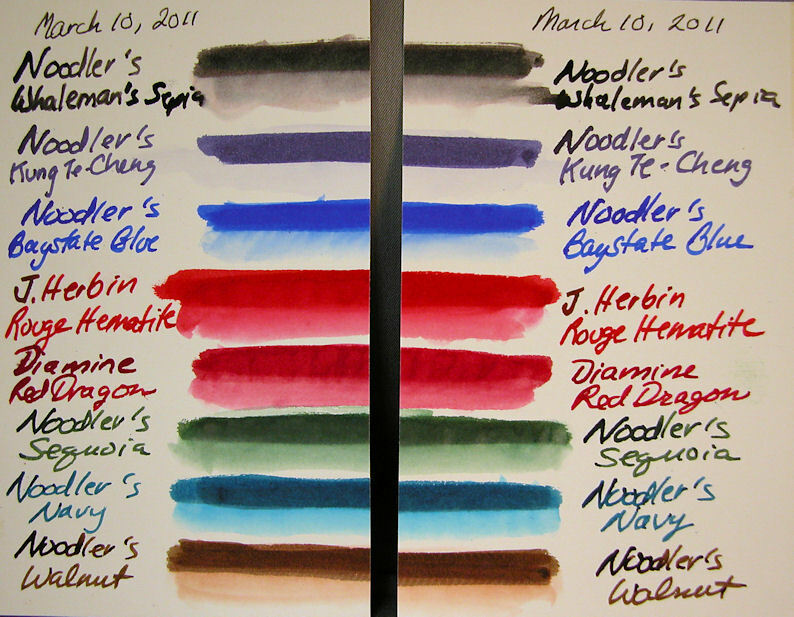 I really didn't have time yesterday to pull out my oil paints, so that gave me a chance to test drive this Noodler's Nightshade fountain pen ink. I thought I'd find it too strong in color, but I think I like it for some monochrome work! It seemed to suit these old brick buildings. I'm still working on my ink and wash ideas. I did this with a Platinum Preppy fountain pen with a .5 nib and Private Reserve Velvet Black ink. I can't even say what a fun time it was doing this sketch! Going out for plein air work with just a sketchbook, pen, and waterbrush is extremely liberating! No easels, paints, brushes, solvents, and umbrellas to cart around. I could get used to this! I have a couple of technical issues that I need to resolve in terms of getting this medium to do what I want it to do, but each time I sketch with it, I learn something. I decided to take the plunge and go ahead and add watercolor over my ink and wash sketch from this morning. Am I ever glad I did! I think the color component takes it to a whole new level, without losing any of the impact of the original ink and wash, which remains visible through the transparent watercolor. Now I'm more excited than ever about pursuing this further, and taking it into the plein air realm as well. I think it might translate well to acrylic also, which could mean big canvases with lots of contrast and subtle coloration on the way later in the season as this develops. 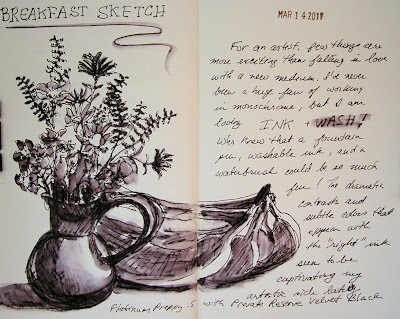 If you'd like to see the initial ink and wash that this started with, or read a transcription of the full text, just scroll down to my post from this morning. If you're viewing this off my blog, you can click here instead. Written text transcription: For an artist, few things are more exciting than falling in love with a new medium. I've never been a huge fan of working in monochrome, but I am loving ink and wash! Who knew that a fountain pen, washable ink, and a waterbrush could be so much fun! The dramatic contrasts and subtle colors that appear with the "right" ink seem to be captivating my artistic side lately. I purchased this Marilyn Price pitcher on Saturday night at RiverWinds Gallery. 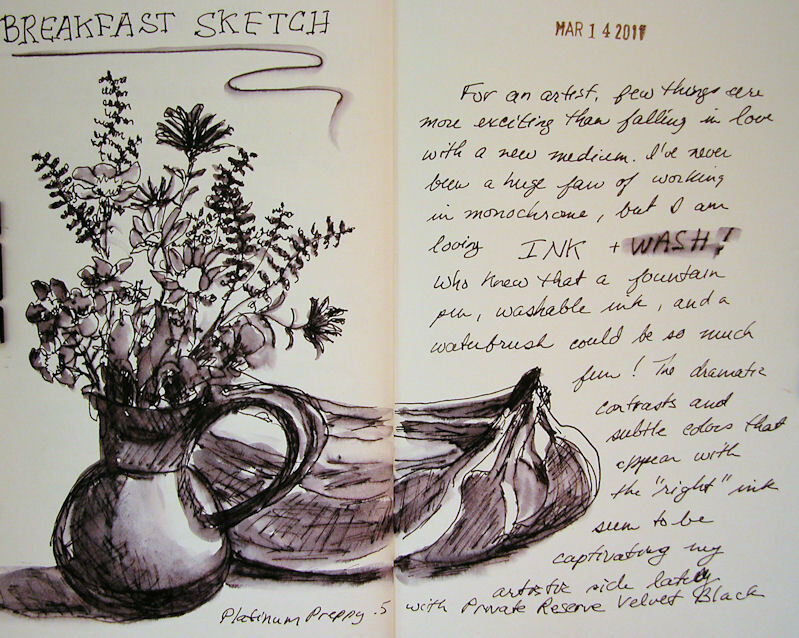 I put some flowers in it and set it on the breakfast table, knowing I'd be sketching or painting it (or both!) at the first opportunity. I'll probably do an oil painting of it this week too. I'm looking forward to exploring more inks and refining my process with ink and wash. Once I feel I have a better grip on this medium, I'll do some on nice watercolor paper that I can offer for sale. Until that time, they'll only be posted here on my Sketches blog. I don't know if you can see the subtle violets in that appear in the washes of this Velvet Black ink. If you saw it side by side with a traditional black, you'd see the difference for sure. I'm thinking about adding some red and yellow watercolor to this sketch. If I do, I'll post it again with the changes. New Inks to Play With, WooHoo! I played with the samples on a sheet of an 11x14" Raffine sketchbook, since this paper is well sized to allow the ink to move with water. I was especially interested in seeing which ones would wash with a waterbrush, and for how long they'd retain that characteristic, and which ones stayed put. The ones that washed the best and longest have small stars next to the name on the test sheet. I kept returning to the samples and going over parts of the writing with a waterbrush. The Noodler's Kung Te-Cheng is definitely Bulletproof. All of the others washed more than that one, with several contenders for ink and wash work. The bottom row of inks is from the March Ink Drop from Goulet Pens. For those not familiar with the Ink Drop, you pay $10 a month, and each month five ink samples show up in your mailbox! You also get a 10% discount on full bottles of that month's inks, in case you fall in love with one of the samples. Other member discounts are also offered. 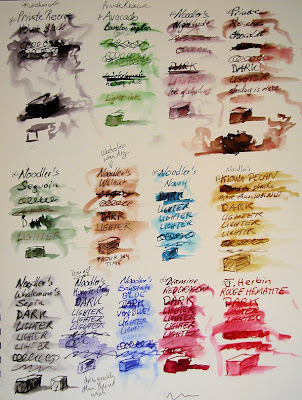 In addition to knowing how much the different inks wash, I am interested in finding out which ones are lightfast. I cut pieces of Strathmore 500 Plate Bristol for this. I know the ink sinks in a lot more on this; maybe it would have been better to do it on a different surface, but I'll see how this goes. Perhaps I will size the paper myself for the next batch. A heavy line of the ink was drawn with a Q tip, going back and forth four times. Then I washed with a waterbrush to draw down some of the ink into a wash line below. I wrote the ink names in on each side with a bamboo dip pen, and the strips were cut in half. The left halves will go into a south facing window. The right halves will be stashed in a wooden box so they will not be exposed to light. I'll keep comparing them over time, and will add each month's Ink Drop samples to the test. I'll report back as I check on the samples being tested. 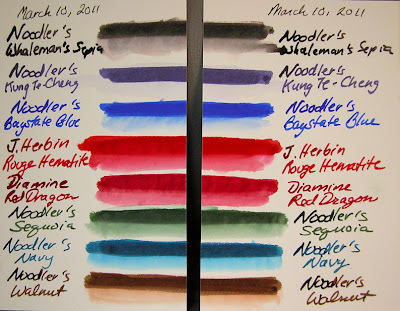 I've selected Noodler's Nightshade and Private Reserve Velvet Black to experiment with first for artwork, and have loaded up a couple of fountain pens from the samples. You can expect to see some of the results from those soon. I went out to paint with my friend Virginia the other day. It was supposed to be 50 degrees and sunny, so we were pretty excited about having a nice day for some plein air work. Well, foiled again! It was freezing cold and overcast. 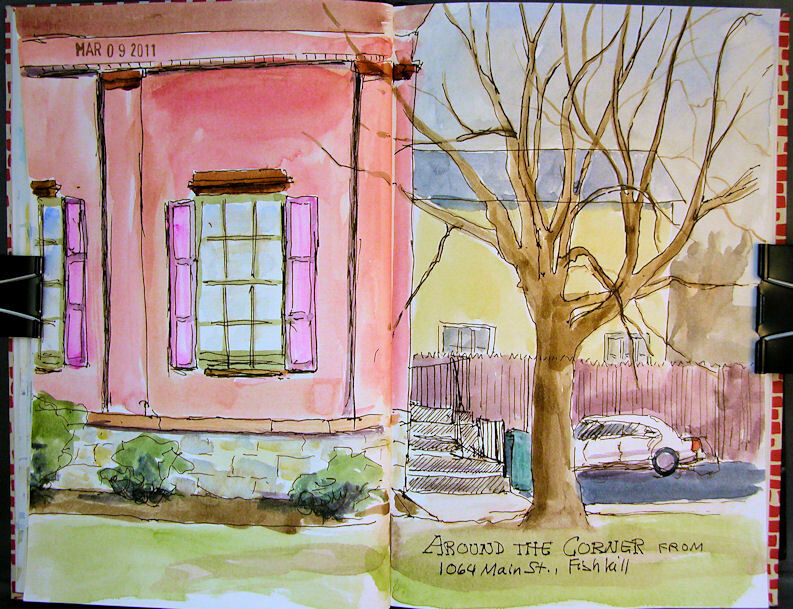 We pulled off onto a side street where there was room to park, and did sketches from the warm comfort of our cars! 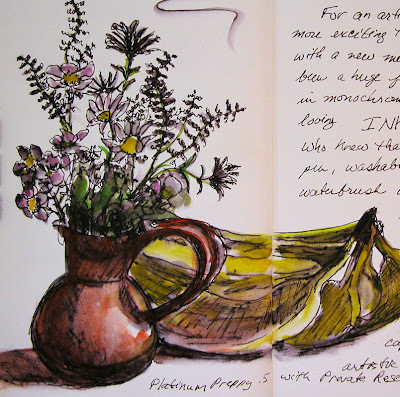 This is across a two page spread in my Fabriano Venezia book. It’s getting really difficult to keep this book opened fully enough to sketch and paint across the center. I might have to ditch it for a different journal. I love the paper, but this binding could be a dealbreaker. I’ve cut a piece of foamcore to the width of the open book, and I can clip each side of the journal to the foamcore back to keep it open. I’ll see if this works out over the long run, or if I’ll have to make a change. I’m also starting to think that I should separate these sketches from my artwork for sale, and post them to a different blog. More on that if and when I get the other blog up and running! About 9x12 across a two page spread in my Fabriano Venezia journal. My husband was at a meeting last night, so I figured I'd do a little sketching. I went to the Wetcanvas website to check out the Weekend Drawing Event images, and they looked like a lot of fun! I sketched the first few that grabbed me looking at the computer screen. 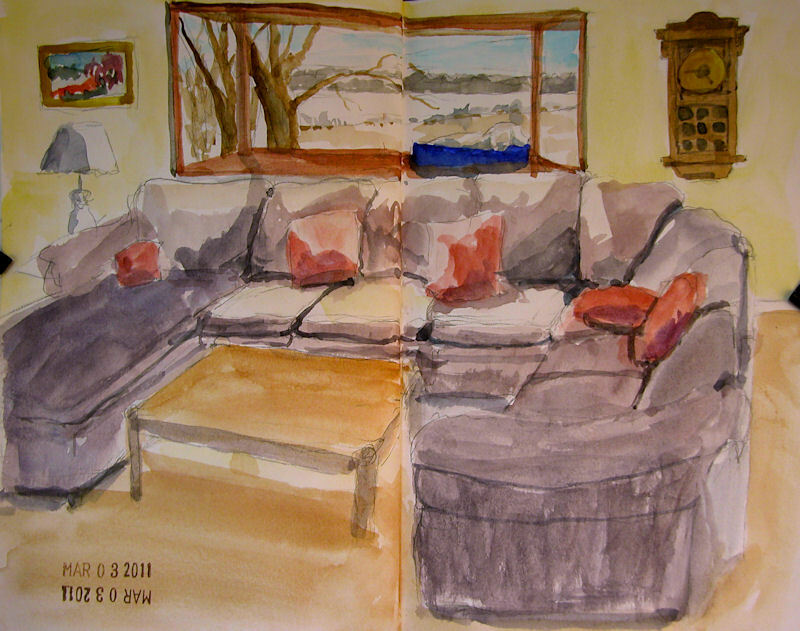 I did the sketches all in ink first, then went back and painted them with watercolor. Fun, fun. Click image for a clearer, larger picture. Size is about 9×12, across a two-page spread in my Fabriano Venezia sketchbook. My dog’s favorite spot is up on the bay window in the living room, where he can survey his kingdom. He can see all the way across the lake, as well as up the driveway. Best of all, it’s near the kitchen, where he never misses an opportunity to sucker somebody into feeding him. This was done with my little 24-color Koi set and a single waterbrush that comes with the set. I am hoping to do more plein air sketches this year, and this is probably the most convenient way to do it, so I’m practicing. 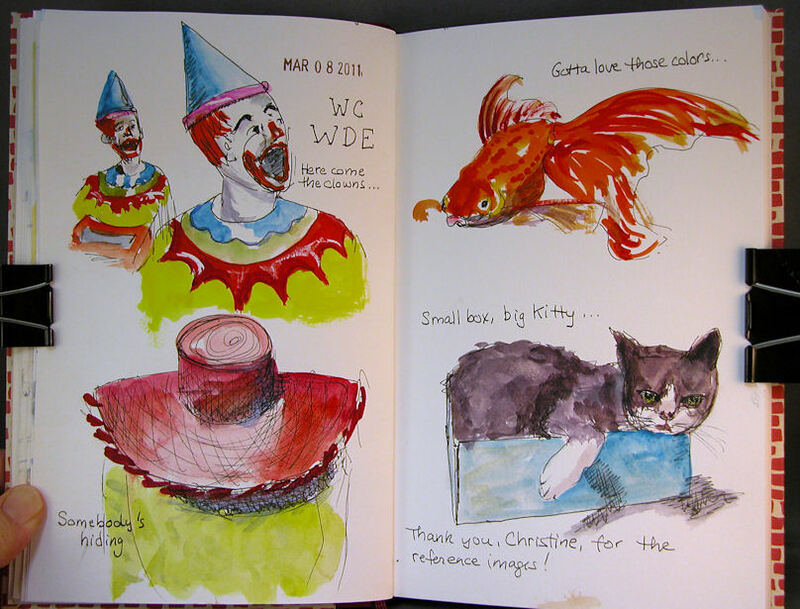 However, I miss the color saturation of my artist grade watercolors. 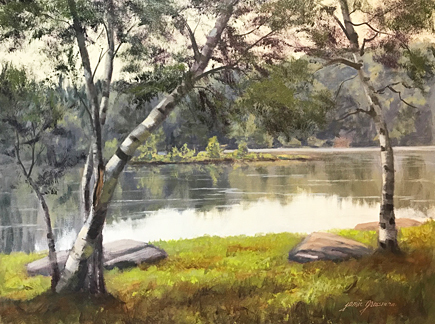 I heard it was going to be 51 degrees and sunny today, so I packed a big smile and headed out the the Newburg waterfront along the Hudson River to paint with my friend Virginia Donovan. Clearly the weather forecast was merely a trick played on me by the weatherman to get me to give up the comfort of my warm studio. In addition to colder-than-forecasted temperatures, there was a stiff wind blowing. I thought about painting from my car, but I much preferred the downriver view, which wasn’t visible from the parking lot. Determined to work outside, I donned a heavy coat, hat, and fingerless gloves. I figured I could at least make it through a sketch or two. This one began with a Lamy Safari fountain pen with an EF nib and Noodler’s #41 Brown ink. 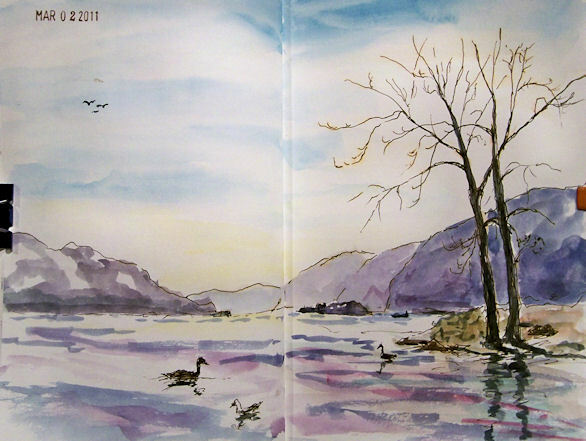 Once I got the elements placed and the trees drawn, I broke out a waterbrush and a Sakura Koi 24 pan watercolor set. I was accompanied by some adorable seagulls and the honking of Canadian Geese. There were still large chunks of ice floating by in the river. By the time I finished the sketch, I was feeling pretty warm. I started a small painting which I’ll have to finish in the studio, since we decided to break and go out for lunch. The afternoon was overcast and there were snow flurries on the way home! Nevertheless, it really felt great to get out and do a little plein air work again. I’ve been doing a lot of sketching lately, though I haven’t been posting most of them. I always feel that things should be displayed in a more “finished” state than what I generally do in a sketch, but lately a lot of people have commented that they love seeing the sketches. If you have an opinion about this, please let me know. One thought I’ve had is to create a second blog and post just the sketches there; then those who are interested in seeing only finished pieces wouldn’t have to subscribe, and those who want to see the sketches can see them on the other site.